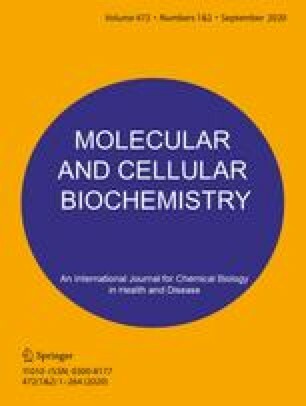 The concentration of calcium-binding protein regucalcin in the tissues of rats was estimated by enzyme-linked immunoadsorbent assay (ELISA) with rabbit-anti-regucalcin IgG. In male rats (5 weeks old), regucalcin was most pronounced in the liver. Liver regulcalcin concentration was about 0.1μM, when it was calculated with regucalcin molecular weight of 28,800. The relatively higher level of regucalcin was also found in the kidney as compared with that of the skeletal muscle, duodenum, testis, lung, heart, spleen, cerebral cortex and hippocampus. Similarly in female rats, regulacalcin was remarkable in the liver, and appeared only slightly in the kidney. Thus, the tissue distribution of regucalcin in rats was specific in the liver. The concentration of regucalcin in the liver was altered with increasing age of rats; liver regucalcin level linearly increased during 5 weeks old after birth of male rats, and then began to decrease gradually. The results coincided with the previous observation of Northern blot analyses by using liver regucalcin cDNA as a probe. The present finding clearly demonstrates that regucalcin is specifically synthesized in the liver of rats.